A review of Hutchesons Bar and Brasserie in Glasgow. Ups: Beautiful building, wonderful food. Down: Food perhaps a little safe. Let the chefs imaginations run wild! Since it’s construction in 1805, Hutchesons’ Hall has had a variety of functions, including a hospital, a bank and a school for orphaned boys. After water damage in 2008, nothing much happened until James & Louise Rusk began a two year restoration process in 2012. 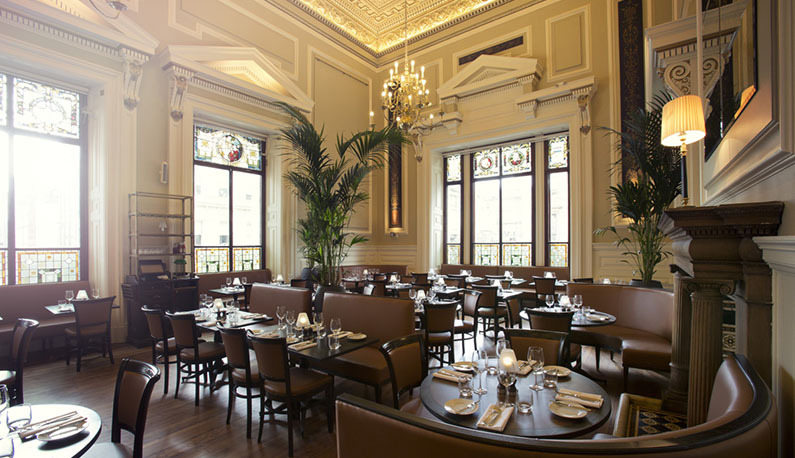 June 2014 saw the unveiling of Hutchesons Bar & Brasserie (158 Ingram Street). The building still holds a lot of it’s historic beauty. Statues of George and Thomas Hutcheson, after whom the building was named, are present, along with original panelling, cornicing and stunning stained glass windows. If you’re looking for grand, then this is most definitely for you. You enter via the 158 Café bar. Clean & light, cocktails & champagne, and very busy. Initially, we were asked to wait at the corner of the bar. A moment later, a second member of staff asked us to move from the corner of the bar – they needed to keep it clear. A moment of herding later and we were escorted to a table at another room at the bar to wait on our booking. This is always a considerate move for a guest. Seat us, look after us, make us feel special. We’re soon escorted through the back of the bar, round the staircase, and up to the star of the show : the double height Grand hall Brasserie. Grand is the operative word. It’s a stunning room and praise needs to go to the Rusks as well as the original architects for the gorgeous results. I already know what I’m going to order. Hutchesons post their specials on their Facebook and Twitter accounts, so I’ve eyed up a venison dish. More about that later. Emma orders the Slow Poached Hen’s Egg with asparagus & truffle hollandaise (moved to the lunch menu since our visit). It’s perfectly presented and cooked, as is my Roasted Bone Marrow with parsley salad, onion jam and brioche. We’re both in heaven. Everything works, everything is fresh, everything looks marvellous. One course in, and it’s an occasion that you know you’ll remember for a long time. Nothing bad could happen in the Grand hall Brasserie. I’m expecting a dream sequence waltz with David Bowie in The Labyrinth to start at any moment. And here is my venison. 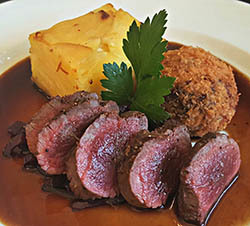 Haunch of Venison, dauphinoise potatoes, braised red cabbage and venison croquette. The venison is lightly peppered, the potatoes generously cubed, the croquette is so crunchy and soft that it makes me like cabbage. That good. Why can’t all meals be like this? We also have the Whole Lemon Sole with toasted almond and parsley beurre meuniere and french fries. You just have to look at the colour of the sole to see that it’s immaculate. The sauce is simple but full-flavoured. We begin to wonder what kind of wizardry is at play in the kitchen. Dessert is Warm Sticky Date Pudding with butterscotch sauce & vanilla ice cream for Emma while I enjoy a 15 year old Bowmore. Actually, we share Emma’s pudding while I keep the whisky. You would have done the same. The dishes we had were not trying to reinvent themselves. We don’t see experiments here, just tried and trusted combinations cooked faultlessly. I wonder if the future will bring more of an attempt to push the boundaries because, with the skill on show, we could see some truly wonderful new fare. With drinks, the bill comes to a little under £100. Because you leave Hutchesons feeling like you’ve had an experiences as well as a meal, you are more than happy to pay a little more. It’s a very special place and I recommend it without hesitation. Photos from Hutchesons Bar and Brasserie website / Facebook page. Hutchesons did a rather sweet tweet in response to the review. It’s really great that people are sharing this inonomatifr.